Pianist Cory Smythe is emerging as a significant pianist in free improvisation and new music circles. 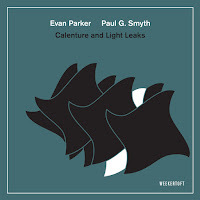 He has appeared on recordings such as Planktonic Finales with Stephan Crump and Ingrid Laubrock, as a member of Tyshawn Sorey’s trio and with Peter Evans. 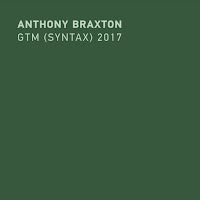 He’s also appeared on recordings of works by Iannis Xenakis and Anthony Braxton. 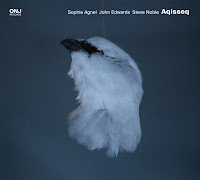 Circulate Susanna is his debut as a bandleader, playing autoharp and electronics as well as piano in a trio with Swedish singer Sofia Jernberg and Daniel Lippel who’s playing detuned acoustic guitar and electronics. 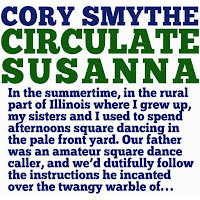 It’s one of the strangest and most ambitious debuts in recent memory, beginning with Smythe’s liner note, which begins in large print on the CD’s front cover: “In the summertime, in the rural part of Illinois where I grew up, my sisters and I used to spend afternoons square dancing in the pale front yard. Our father was an amateur square dance caller, and we’d dutifully follow the instructions he incanted over the twangy warble of Stephen Foster and George Washington Dixon…” The piece continues, becoming increasingly strange and poetic with his father’s tales: “The Foster and Dixon tunes that undergirded Father’s stories, arriving to us as they did via wilted vinyl, windspun and re-tuned by the filtering fibers of the cotton ceiling and the coarse earth, made it easy to imagine the kind of harmonies that might bend, burble, and howl in the distant world of his invention.” With this unusual narrative, a 40-year-old American post-modern fixes his roots with a surreal passage to the songs of minstrelsy, setting himself within the bizarre moral compass of American music and its roots. 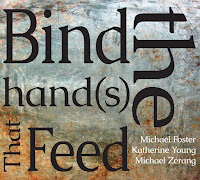 As much poet as pianist and songwriter, Smythe’s works here are insistent probes into an imaginative ground. Lippel’s detuned guitar insists on a chance relation of quarter tones and dissonances with Smythe’s piano, and in American music, from Blind Willie Johnson to Harry Partch, quarter tones are invitation to national dreams as well as the moral and cognitive dissonances associated with American song, from minstrelsy to the white blues of the ‘20s and ‘30s. Jernberg’s voice is an exploratory instrument, consisting as much of shamanistic cries and yips as words and notes. From the first episode, “Susanna soil flutter,” we are set loose in a dream. The fascination of the jazz avant-garde with American folk materials and their complex significance goes back at least to the work of John Benson Brooks and his recordings of folk songs, first with Zoot Sims and Al Cohn, and then as part of his marvellous Alabama Concerto, crafting a four-part work from his work as a researcher for folklorist Harold Courlander (recorded with Cannonball Adderley, Art Farmer, Barry Galbraith and Milt Hinton, it’s an obscure marvel of 1958 jazz). More germane are George Russell’s marvellously dissonant and expressionist recording of “You Are My Sunshine” with Sheila Jordan (in 1962) and Patty Waters’ wonderful “Black (Is the Color of My True Love’s Hair),” from 1965. 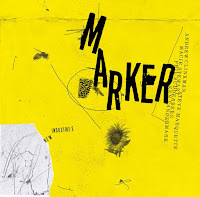 Songs plus context, inferences and contradictions, these suggest a necessary exploration that continues here, a search for roots and resonance as well as freedom, a becoming that moves backwards as well as forwards, part shock, part treatment. 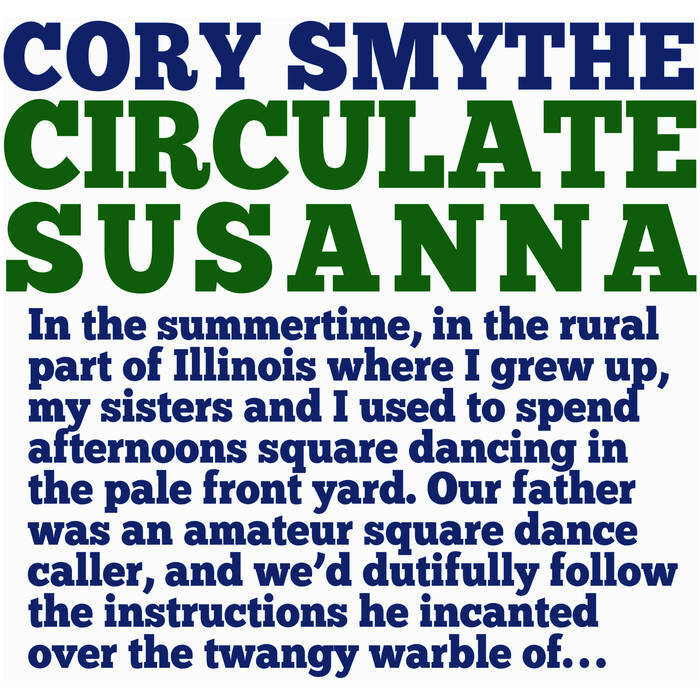 Circulate Susanna , advancing the project, is both summoning of memory and a critique of its very possibility and authenticity, an investigation that probes the nostalgia at the heart of American experience (whether mere sentimentality or a profound longing for home—a mark of many first-rank American writers from Twain and Stein to Frederick Exley as well as American music, including the mawkish absurdity of Jolson’s “Mammy”: “ My heartstrings are tangled around Alabammy.”) Smythe’s memories of his rural Illinois childhood and the ancient songs of Stephen Foster (once wonderfully summoned and placed by the poet Paul Haines in his “note” to Albert Ayler’s Spiritual Unity as “foster melodies of my foster mother,” displacement and substitution upon displacement and substitution) may trigger these visions; once one begins to listen to this music, however, any sense of fond memory disappears—it’s an invocation unseated and unsettling, as meanings emerge in the random intervals between guitar and piano, in the quavering electronics and vocal eruptions. It is the past without order, song singing out in an intense, shapeless present. And killed five hundred n-----. To appreciate the full madness of that passage, from the song that made Foster America’s first full-time songwriter, a “bullgine” is generally defined as a steam engine, another mode of travel to add to the horse and the electric telegraph that transports and kills. The final performance of Circulate Susanna may be the most disconcerting here: it’s a free deconstruction of Abel Meeropol’s “Strange Fruit,” the song that in Billie Holiday’s original version was the utter repudiation of all the clichés of minstrelsy that had endured so long in American song. Called here “To gather the wind” and its text a series of fragments—"And at the root…In the southern breeze…The gallant south”—it surrenders all the form, focus, and coherent effect of the Meeropol/ Holiday work for a scattered series of disconnected sonic bruises, breaks and contusions, a brutal conclusion to the very possibility of song. It’s a bravely unattractive finale for what a fascinating verbal/musical probe, carrying the project to a conclusion at once as logical as it is dark, a music becoming inaccessible in the moment of its authentic recognition, a performance that will color, even contaminate, yet authenticate, any future hearing of the original. Circulate Susanna (what goes around comes around?) is a startling proposal. Smythe’s music is as arresting as it is challenging.